The European Union (EU) and Azerbaijan are close to agreeing a text of a new agreement that would provide for a contractual relationship between them. The parties also hope that it may be initialed in the next weeks, top officials of the both sides told a news conference. EU High Representative for Foreign and Security Policy Federica Morgherini; EU Commissioner for Enlargement and the Neighborhood Policy Johannes Hahn; and Azerbaijani Foreign Minister Elmar Mammadyarov told a news conference at the end of the 16th session of the EU - Azerbaijan Council in Brussels. Mammadyarov said that 95% of the text had been agreed and asked for EU’s flexibility to agree the remaining 5 per cent. “We are very close to the end of our negotiations,” the ministry’s press service quotes the minister. “Recently, we were able to synchronize negotiations in all three parts. Today we have pretty good chances; more than 90 percent have already been agreed... I think that we can complete the negotiations in the near future,” he said. Initially the EU had offered Azerbaijan an Association Agreement similar to the one signed with Georgia and Ukraine, but the Azerbaijani government refused and said it wanted instead of a bespoke "Strategic Agreement", reflecting Azerbaijan's position as a key energy supplier to the EU. 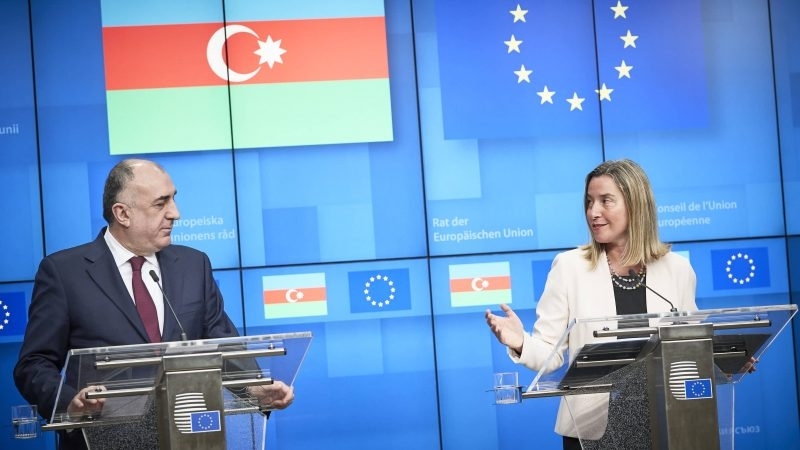 Speaking the press conference on April 4, High Representative Morgherini reiterated that the European Union fully supports the independence, sovereignty and territorial integrity of Azerbaijan. Mogherini also said that the EU was ready to assist in the process to resolve the Nagorno-Karabakh conflict, through its support for the OSCE Minsk Group co-chair, through the good offices of its Special Representative for the South Caucasus and through people to people contacts and confidence-building measures. At the same time, Mammadyarov noted that the parties had begun a separate dialogue with the EU in the field of transport. "We are also negotiating a single aviation agreement," he said. In addition, Azerbaijan, together with its partners, is completing the construction of the Southern Gas Corridor, which will allow supplying more natural gas from Azerbaijan to the EU market. For Europe, it will be a new source of energy. "Azerbaijan has made this possible. If EU partners want to get more gas from Azerbaijan, they should make more efforts to make the EU market attractive to Azerbaijan," the foreign minister said. Negotiations on a new partnership agreement between the EU and Azerbaijan can be completed by mid-May. The European Union Commissioner for Enlargement and Neighborhood Policy Johannes Hahn said this at a press conference following the meeting of the Azerbaijan-Europe Cooperation Council in Brussels. “If we start on time [the last phase], we can really complete the negotiations on the agreement, and it will be agreed on the eve of the 10th anniversary of the Eastern Partnership, that is, in mid-May. I think it is important to have such an agreement,” he said. Khan noted that the EU and Azerbaijan are close partners in many areas. “The EU remains the largest trade and investment partner of Azerbaijan. According to our partnership priorities, we strive to strengthen our economic ties, including by maintaining a steady diversification of the Azerbaijani economy, supporting its membership in the WTO and improving the business and investment environment as a whole,” said the European Commissioner. According to him, a strategic partnership in the field of energy has also been established between the parties, as evidenced by the cooperation along the Southern Gas Corridor. “We are interested in supporting the development of the Baku International Sea Trade Port and the free trade zone,” said Khan. He also expressed the hope that in the near future, the EU and Azerbaijan will complete negotiations on a general aviation agreement. It should be noted that in November 2016, the EU Council issued the mandate for the European Commission and the High Representative for Foreign Affairs and Security Policy to negotiate on behalf of the EU and its member states on a comprehensive agreement with Azerbaijan. Undoubtedly, we also want close relations with Europe, but what can Azerbaijan offer besides oil and gas? Europe consists of 28 countries, and each of them has a developed agricultural sector, and it will be very difficult for Azerbaijani goods to compete in the European market. Regarding this topic, each time we ask ourselves: what do the parties mean by the phrase “a new agreement on strategic partnership between the EU and Azerbaijan”? Again, we repeat: the simplification of the visa regime (or even non-visa) with Azerbaijan does not mean the strategic nature of the relationship between Brussels and Baku. In any case, it cannot be compared with the opportunities that open up for the EU in the case of the signing of these agreements. Here we are talking, of course, about energy projects in Azerbaijan, the path of which has been laid in Europe. Brussels is not expecting anything more from Azerbaijan. As far as the trade relations between the parties, we still do not know if they will be taken into account in these agreements. However, we assume that business will not come to the opening of the EU markets for Azerbaijani goods. Many expect visa-free travel with Europe, but how many of our citizens will be able to take advantage of this, given that many of them do not even have the means to visit their relatives in districts of the country. However, Azerbaijan had previously supplied oil and gas to Europe, that is, it did not have great significance for the development of the economy. And at the moment Azerbaijan, like air, needs an increase in export opportunities. Due to the acute financial crisis and low oil prices, the financial airbag has narrowed considerably. Exporting our products to Europe would solve these problems at least partially. But it seems that no one thinks about this in Brussels. They would have to fill the Azerbaijani market with their goods. Many may object, saying that in this sense we can offer Europe? Yes, they agree: our products are uncompetitive. But, on the other hand, since the conversation is about a strategic partnership, these agreements could provide some benefits for our products. And this would make it possible to somehow explain the strategic nature of our relations. Trade, visa-free and energy projects - these issues are secondary. And all the more, given the current difficulties that the European Union is experiencing, all these issues lose their attractiveness. As we have already written more than once, in these agreements, the priority should be the unequivocal support by Brussels of the territorial integrity of Azerbaijan and the call for Armenia to release the occupied territories of our country. The presence of this item could also indicate a strategic relationship between Azerbaijan and the EU. However, Europeans do not want to understand the main thing. And we also cannot understand why the whole of Europe supports the territorial integrity of Spain, Georgia, Moldova, but apply double standards to Azerbaijan? Our discontent is quite fair. After all, European politicians come to Baku, hold talks, and, it seems, return to their homes with ready-made answers. And the future of this agreement depends on the forthcoming reaction of Europe.